2012 saw the centenary celebrations of Brenda Chamberlain. Born in 1912, Brenda was brought up in Bangor and like many other Welsh women writers (including Margiad Evans) she initially trained as an artist. A selection of her art work can be viewed on the Martin Tinney Gallery website. Chamberlain is known within Welsh Writing in English for her accounts of island living including life on Ynys Ennli in Tide-Race and the Greek island of Ydra in A Rope of Vines. However, perhaps one her most interesting ventures was a project which allowed her to combine her passion for image and word. During the Second World War Chamberlain set up the Caseg Press in Llanllechid with the help of her partner, artist John Petts. Original copies can be found at Bangor University Archives. 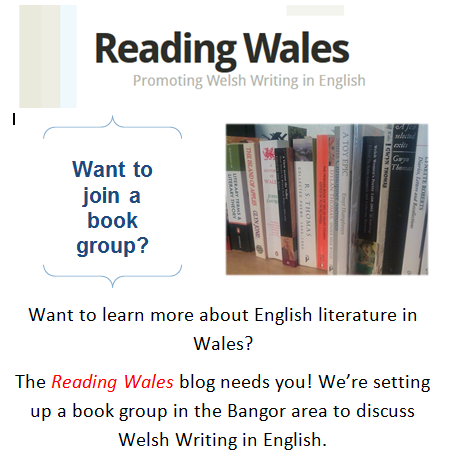 Reading Wales Book Group Needs You! Today, Thursday 7th March, is World Book Day – the perfect time to announce the launch of the Reading Wales book group. Do you live in the Bangor area? Do you want to learn more about English language literature in Wales? Postgraduate Alex and Palas Print owner Eirian are joining forces to establish a new book group. Welsh Writing in English is established in academia but this book group will aim to promote it to the wider Welsh community. If you’re a new mum, retired, or just fancy trying out something new, the book group will offer the time and space to discuss a literary tradition that is important to Welsh culture. Our aim is to meet every month, and the first meeting will give us a chance to discuss when and where to meet, and most importantly, what books to read. The first meeting will be at the end of March. Anyone interested in joining the group, or just finding out more should contact Alex Ross by email eluc47@bangor.ac.uk where she will provide further details including the date and time of the first meeting. Or you can contact Eirian James at Palas Palas Print on 01286 674631, or 01248 362676, email eirian@palasprint.com or just pop into the shop. Channel-hopping one evening and suddenly I see Rolf Harris singing on Bangor pier – were my eyes deceiving me?! No, this was ‘Rolf on Welsh Art’ and this episode was dedicated to Bangor-born artist and writer Brenda Chamberlain. During the programme Rolf makes his way to Bardsey Island (Ynys Enlli). The island is a place of ancient Christian pilgrimage and was home for Brenda between 1947 and 1961 and the subject of her book Tide-Race. What strikes you is the relationship the islanders have with their surroundings, both on and offshore. Described in dozens of ways, each description of the sea is simultaneously believable and terrifying. It torments and it placates, it gives and it takes away. It is what makes the island at once a secluded sanctuary and a hellish prison. Tide-Race encompasses a breadth of experience from Jack Issacson the Ancient Mariner to the children of the island who could not ask for a more unique playground. With a population of less than fifty there is still plenty for Chamberlain to chronicle including the quarrels of nosey neighbours, the superstitious fisherman and bodies washing up on the island’s shores. A place to escape, yet full of foreboding Chamberlain conveys the charm that pulls one towards the island and the brutality that fends one away. For an island that is supposedly the resting place of twenty-thousand saints, Tide-Race evokes its unique essence. As Jonah Jones mentions in the afterword, in terms of text and image there is nothing else quite like Tide-Race. An evocative account of life only islanders can comprehend, intertwined with Brenda’s own line drawings of the islanders themselves- it is an account of Wales and all of its elements. Happy St. David’s Day from Bangor! Dogs aren’t just for Christmas and Welsh literature isn’t something that should just be celebrated on one day of the year. As a primary school pupil I loved St. David’s Day. It meant dressing up, playing my violin at the school Eisteddfod, singing and thinking up bardic names for the poetry competitions. Around nine-in-ten 16-24 year olds (89%) and 25-34 year olds (91%) attended an arts event once a year or more often and this level declines as we move through the age groups with the lowest level being recorded by those aged 65+ – 58%. Whilst Welsh Writing in English is actively researched by students and academics it is vital that the tradition and its authors are accessible to the general public and to people of all ages. By encouraging a more diverse readership this creates a broader range of ideas and opinions about Welsh literature and (most importantly!) encourages Welsh writers to continue writing in a country that historically supports its creative arts.